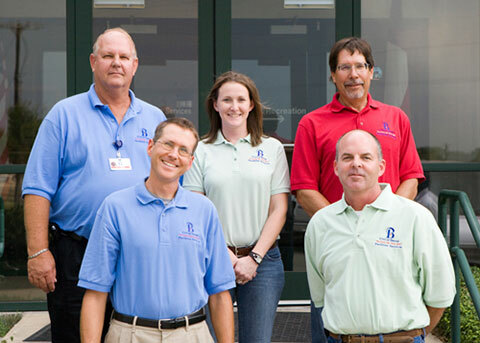 The City of Bryan’s Facility Services Department’s purpose is to plan, direct, coordinate and manage an effective maintenance and custodial program for the City’s public buildings and park facilities. Our mission is to provide our customers and employees with an honest, courteous and responsive level of service where every Facilities team member is dedicated to servicing the City’s public facilities and parks with exceptional workmanship, integrity and a conscientious effort to maximize the City’s financial resources. We encourage you to read on and find out more about each individual group within our department and how we provide services to the City of Bryan. The Facility Services Project Coordinator is responsible for building-related construction projects such as new buildings, remodels, and various repair projects. Duties also include administration of maintenance and construction contracts, monitoring of building controls, and implementing energy saving measures in City buildings. Our non-mechanical technicians remain busy maintaining all of the city’s parks, pavilions, walking trails, play ground unit construction/maintenance, buildings, furniture repairs, office and building remodels, painting, removing graffiti and doing various other non-mechanical jobs throughout the city. On a daily basis, the Mechanical Maintenance Technicians are making sure that the estimated 15,000 light fixtures, 600 individual pieces of mechanical equipment, 650 tons of air conditioning, 12 back up generators, 1,200 plumbing fixtures, ball field lighting, and 3 pools are maintained and functional. They also maintain and make repairs to electronic management systems and electronic access/security control systems to the city’s public buildings. Over the past years we have implemented a comprehensive preventive maintenance program which includes prescribed maintenance tasks being performed on a regular basis for each piece of equipment and pools thus extending the useful life of all equipment and preserving the large capital investment by the city. There have been many advances in technology regarding building automation systems over the past few years. The staff is up to date on the changes and our citizens can be proud knowing that we are working very hard to maintain all of these facilities in a state of the art manner with regard to energy efficiency and operational productivity. Due to the size and specialized nature of some equipment within a few of our larger facilities, we currently use a contract with an outside mechanical contractor to perform those HVAC tasks that we cannot efficiently perform. We will experience long-term savings through this effort by our not having to add additional staff to handle these occasional demands. We use outside contractors to provide other services such as elevator maintenance and inspection due to licensing requirements to perform such tasks. The duties include restroom care, carpet and hard surface floor care as well as all routine cleaning tasks. Our Custodial Staff is responsible for maintaining an estimated 218,500 sq. ft. of cleanable area. This is accomplished by using both City of Bryan personnel and outsourced cleaning personnel. Our employees take a lot of pride in their customer service and the appearance of the city owned facilities.